Least expected among insect builder is the stonemason’s trade. Neither ants, wasps, or bee work with stone. How remarkable it is that a caddis insect, working only by inherited instinct, can select grains of sand or pebbles and fit them together to make a neat case or cell within which it lives sale from its ennemies. These stone-case builders are common almost everywhere, but are especially abundant in tumbling moutain streams. 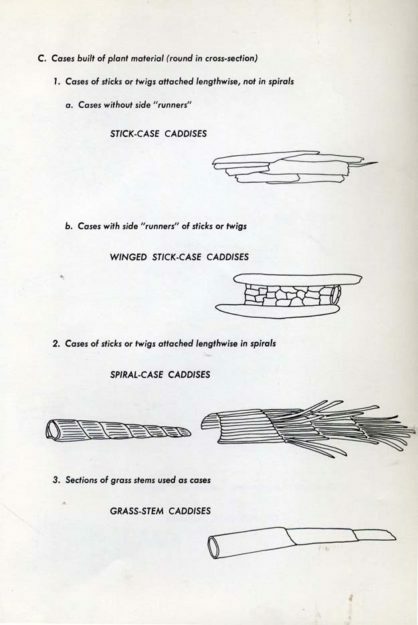 Seemingly, the caddises that build case of sticks and grass stems are most apt to be found in quiet brooks or still ponds where their cases will not be tossed about by currents. Stone cases are relatively heavy and « stay put » even in strong currents. There are, of course, many exceptions. I have collected numerous caddises with cases built of bits of bark in streams of the Great Smoky Mountains where the foaming waters tumbled down from one ledge to the next. There are nearly different families of caddis insects, about a dozen of which contain members that constructs sand or pebble case. Some kinds construct their cases in the form of straight tubes, while others make cases that are trumpet-shaped or coiled like tiny snail shells. Their methods of case building vary. 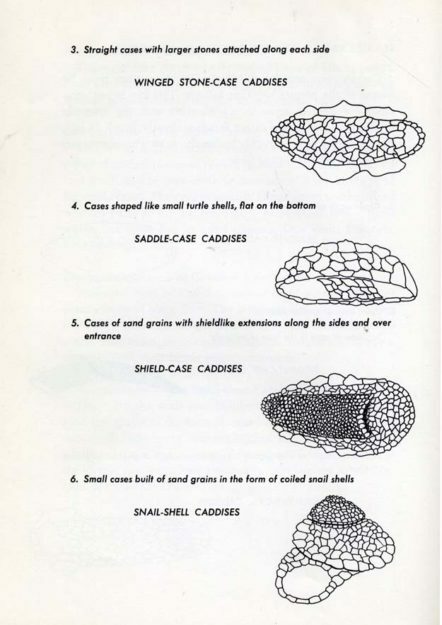 Some kinds add new sand grains or pebbles at the front end as they grow larger ; others adjust the sizes of their cases by removing building stones from the back end and adding them to the front. In yet other instances, the caddises simply build new cases when the old ones become too small. Normally the same kinds of caddises use the same sort of building materials but if these are not available they will often use whatever they can find. In this respect they are quite adaptable. There was once a lady in England who was able to induce some caddises to use gold dust for case construction. 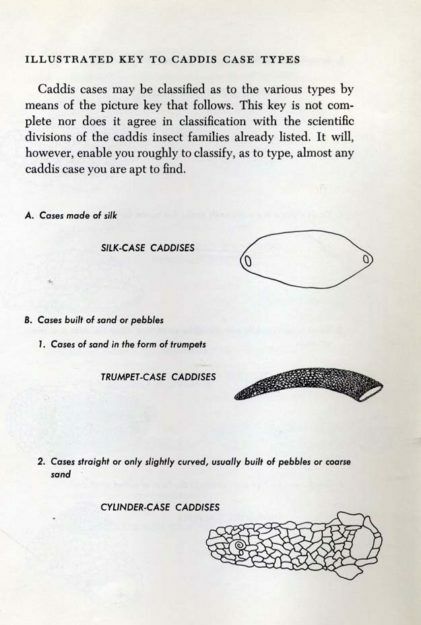 These were probably the most expensive caddis cases know! It is a stange fact that caddises appear to select especially pretty stone for their cases. It was found, for example, that in a Nevada stream where a number of opals were present among the gravel, the caddises had built cases consisting almost entirely of these precious stones. What could be the possible advantage of this self-adorment is not easily explained . 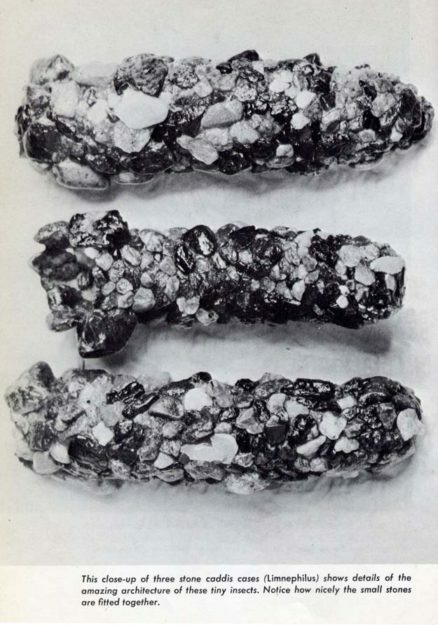 In the Rocky Mountains, caddis cases are often set with bits of garnet and other colored stones. Perhaps the caddises, having rather poor eyesight, merely pick up any stone or pebble which is shiny or colorful and which is the right shape and size. While collecting these insects in a stream beneath the towering Teton Mountains of Wyoming, I once found one case having a bit of gold-bearing quartz. 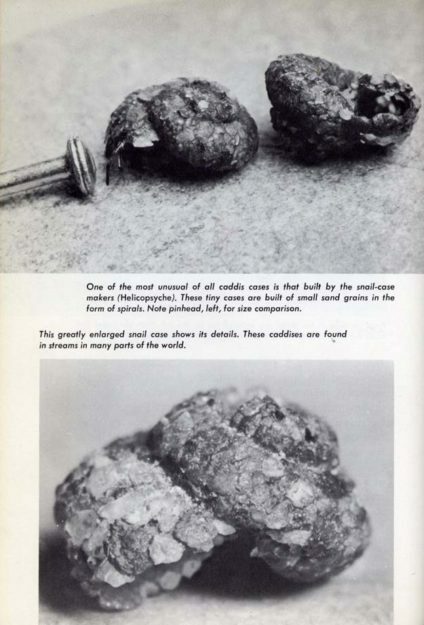 And a caddis case was found in Montana having two small gold nuggets attached to it. 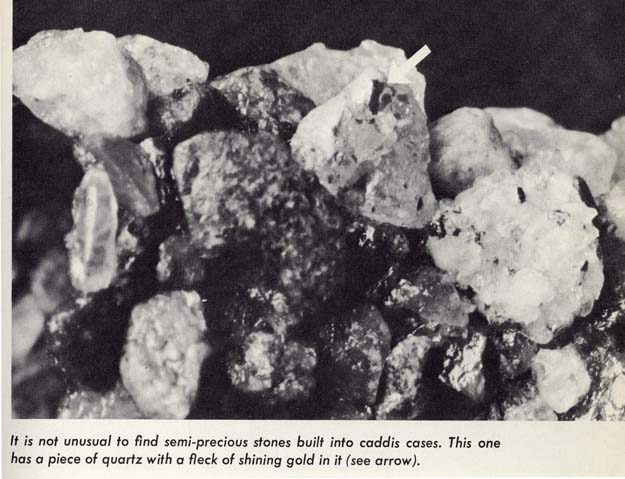 This same case also contained semi-precious stones including columbite and cassiterite. (Columbite is imortant in this Atomic Age because it is résistant to radiation damage and can thus be used in atomic reactors. 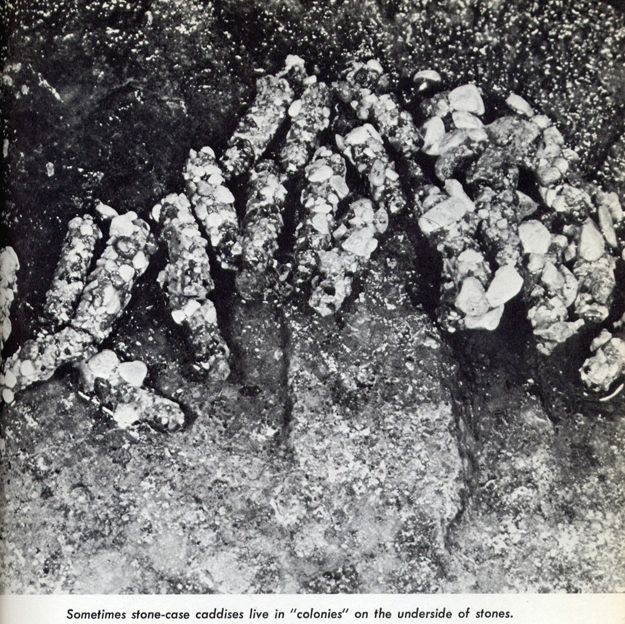 Cassiterite, sometimes called « stream tin », contains considerable tin.) Due to the fact that, in general, caddis larvae construct their stone case of whatever pebbles are present on the bottom of the streams where they live, they are fairly well camouflaged. While resting quietly upon the bottom they are not easily seen. When crawling about, however, one’s attention is drawn to the mat once. Some caddises are much more skillful than others in the art of fitting the pebbles together. Some kinds select and fit the pebbles neatly in place so that they form a smooth mosaic, while other kinds simply cement any small stone, regardless of shape, onto their cases. 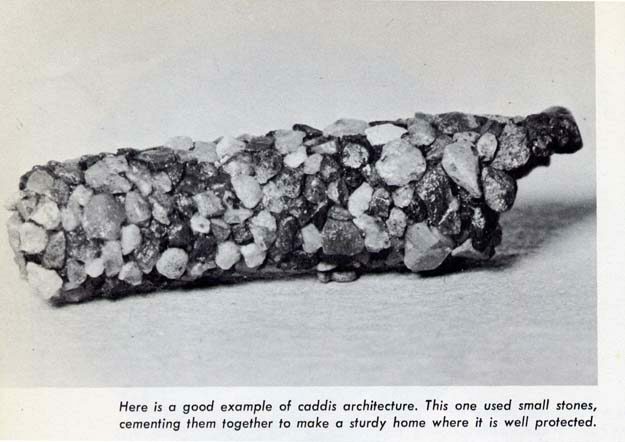 Then, too, some caddises change building materials as they grow older . 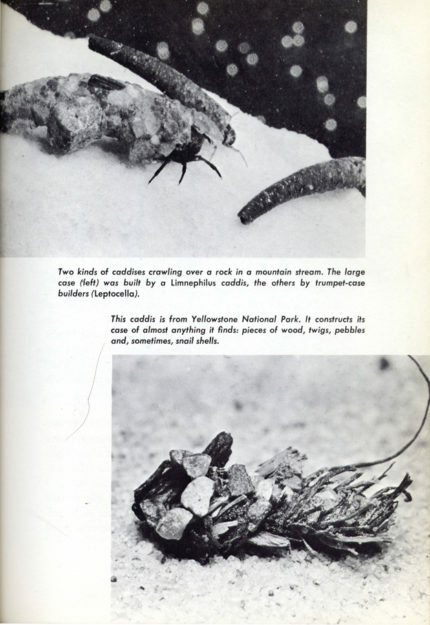 For example, there is a common caddis in Yellowstone Park that uses small sticks during the first part of its larval life, then changes to pebbles. The result is that the rear end of the case are built of sticks while the front ends are of pebbles. 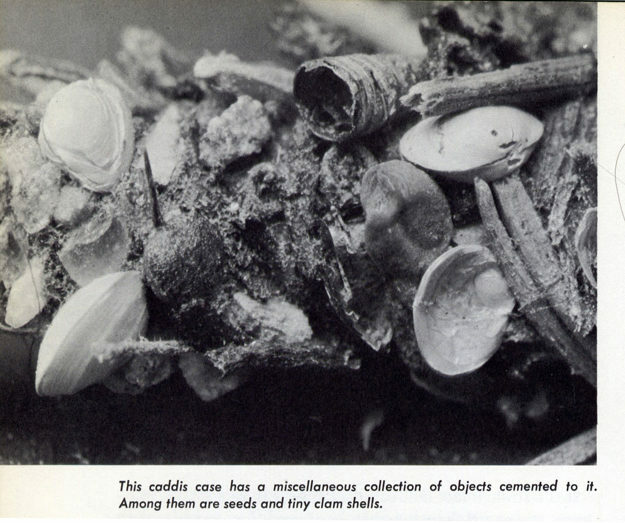 Probably the most unusual items used for case construction are small mussel shels which are often cemented to the caddis cases along with the pebbles. 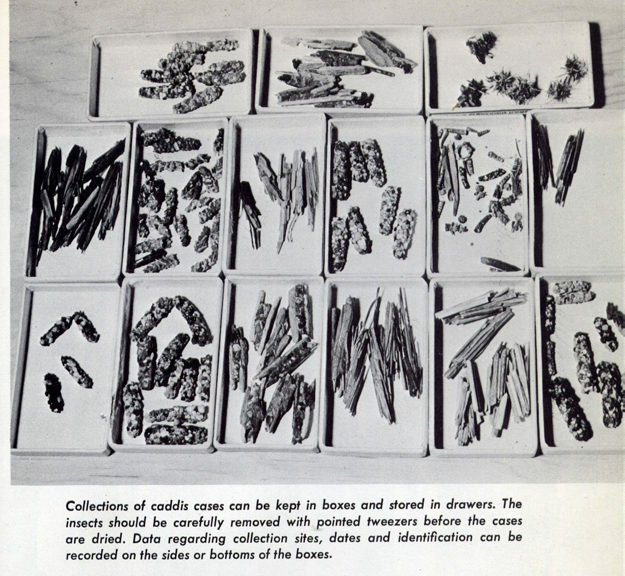 Sometimes a caddis case will be found that consists almost entirely of tiny snails shells. 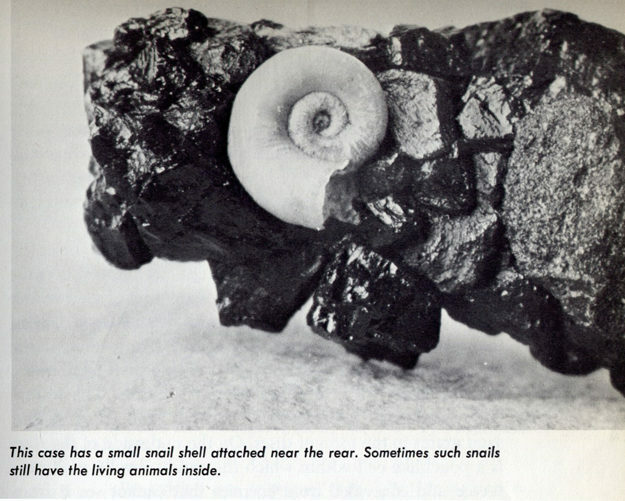 What is especially amusing is that caddises, perhaps because of that poor eyesight or simply because they do not care, often use snails or mussels with the living inhabitants still inside ! Such a caddis may try to crawl one way while the protesting little mussel or snail, having ideas of its own, tries to crawl some other way. In most instances, the caddis, because of its larger size, gets its way and wins the tug-of-war. Plant seeds of various kinds are also cemented to the cases among the pebbles. Sometimes these seeds sprout while still attached to the caddises. 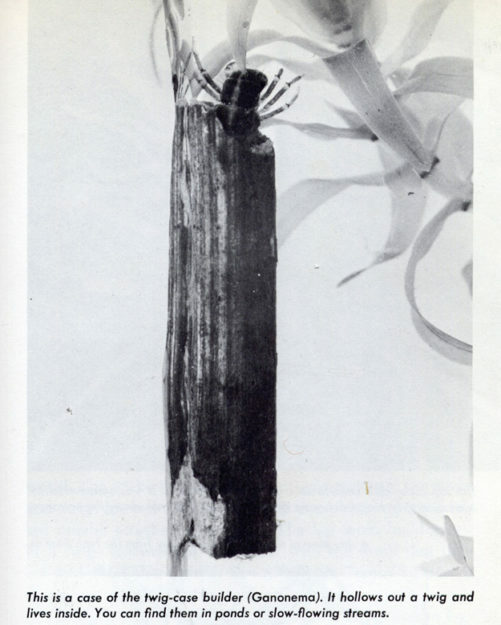 When this occurs the insect often has difficulty in moving about since the seedling plants becomes entangled with objects along the way. While the stonemason caddices construct their cases in many forms the most attractive, perhaps, are the cornucopia-case makers (Leptocella) .These cases are built of sand grains closely cemented together into gracefull horn-shaped houses that are either straight or slightly curved; These stone cases are small in size and light enough to enable their inhabitants to swim freely with their legs extended outside. The water-penny caddises (Athripsodes) construct their cases of fine sand grains in the form of discs. On the underside of the disc is a pouchlike cell within which the caddis dwells, well protected and concealed from ennemies that cannot see it form above. Another stonemason of the caddis clan is the saddle-case maker (Glossosoma) which could more appropriately, be called the turtle-shell caddis. These caddises build small cases of pebbles that resemble very closely the shells of turtles. They are dome-shaped and flattened on the bottom which has a cross-piece. This leaves opening fore and aft for the insect’s head and tail. As these caddises creep over the surfaces of submerged rocks they resemble tiny turtles. When ready to pupate, they cement their cases down to stones in such a way that few ennemies can bother them. 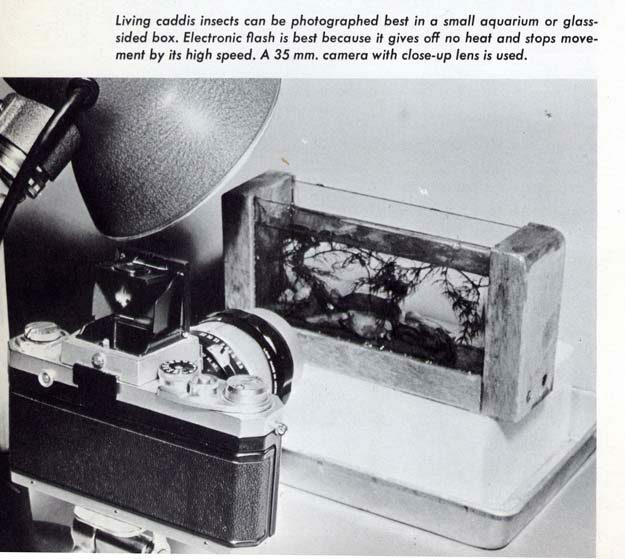 There are many amusing and interesting little experiments that can be carried out with caddises and which shed lught on insect psychology and behaviour. 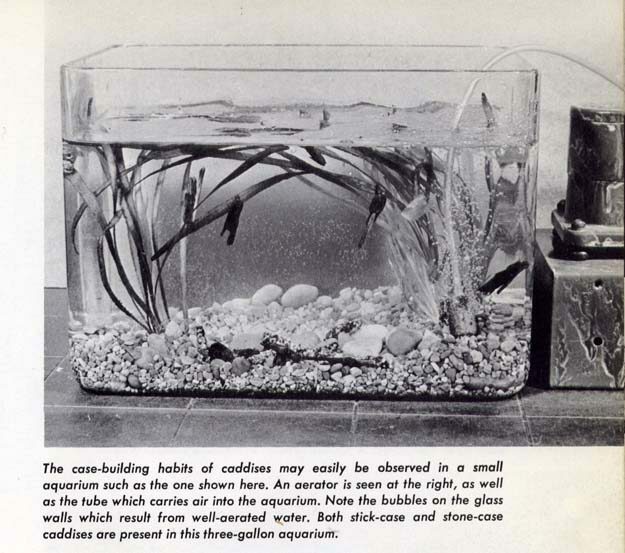 Suppose, for example, that you were to remove several caddises from their cases and then place in an aquarium where there was very little building material. What would happen ? At first, nothing would happen because each one would find a few pebbles. Later, when the supply of pebble began to run out, there would be considerable fighting. Since some caddises are much more agressive than others they are not above stealing from each other. Sometimes such an individual will even pull o a pebble already cemented to the case of one of its fellows. Here, whether we care to admit it or not, we are perhaps encountering some human characeristics! Such captive caddises that have had their cases carefully removed can often be made to construct cases of unusual things. We have already mentionned the British lady who got her caddises to build cases of gold dust. Caddises will also use small glass fragments and if these fragments are of colored glass the results are apt to be very attractive and unusual cases. I once had the idea of tricking some captive caddises into constructing cases of small colored beads and bright sequins, but the project was a failure. They would not use the colorful structural material I offered them, probably because they prefer, or are accustomed to, rough pebbles with sharp edges. Possibly they could not grasp the smooth surfaces of the beads and sequins in their jaws. While caddises usually select the types of building materials to which they are accustomed, some experiments have been carried out which lead one to believe that some kinds almost have reasoning abilities. 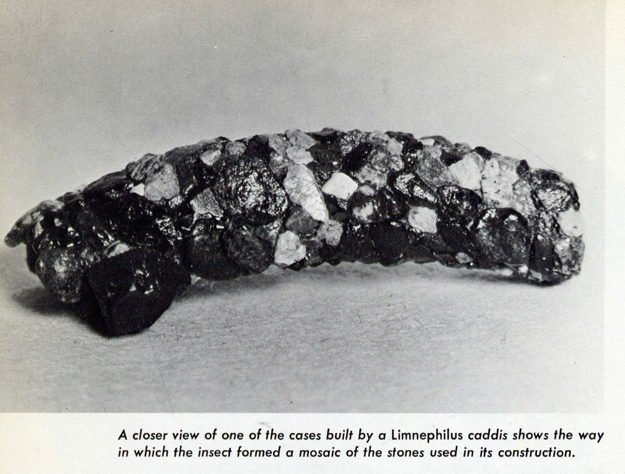 Supposedly, a caddis that normally uses sand grains or pebbles for construction has had no experience in cutting its building materials up into smaller pieces. Thus, it was a little surprising to find that such caddises would sometimes accept and cut up plants material when pebbles were not available. There appeared to be considerable variation in « intelligence » among the various individual insects, however. 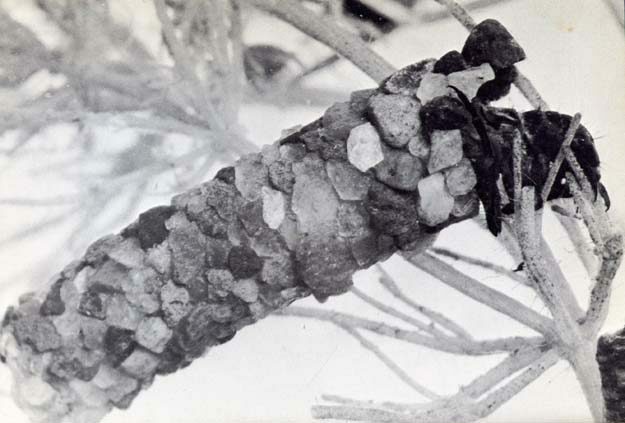 Some users of sand grains for cell construction at once made use of spruce needles and small sticks when sand was not present. Others could not makes the change and failed to build cases when deprived of their normal building materials. 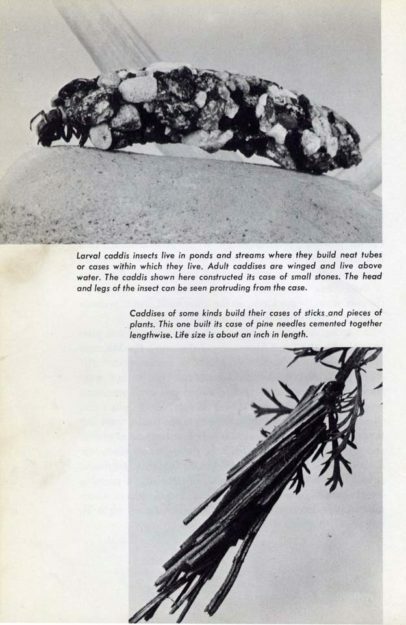 Since caddises, like other insects that build things, work by instinct or inherite skill they tend to specialize in their choices of buildering materials and in their type of construction. A human craftsman by contrast, has the ability to reason and can use whatever material seems best for a particular job. Instincts are rather fixed and the lower animals that live by instincts cannot change, to any great extent, their methods of doing things. 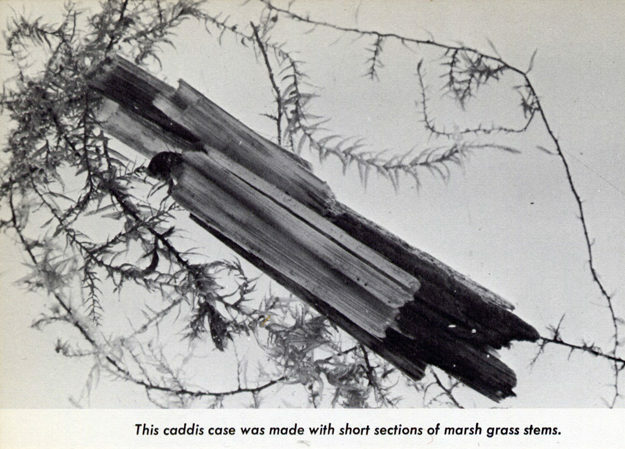 Stick-building caddises tend to construct cases that are quite characteristic for each kind or species. For instance, caddise of the family Phryganeidae build case of bits of plant material cemented side by side in spirals down the lengths of the cases. 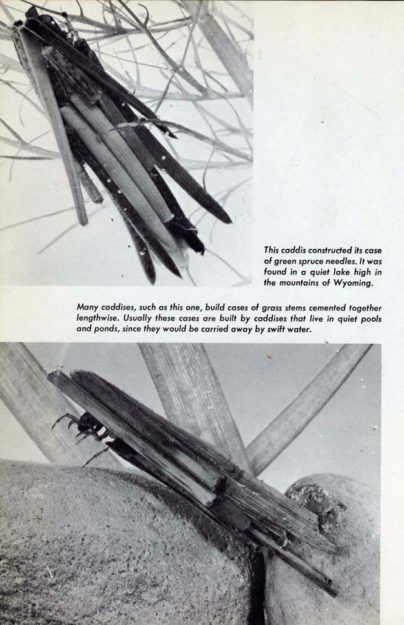 Since these caddises use light vegetable material for case construction they seem to favor the quiet waters of marshes, pools, and lakes as dwelling places. 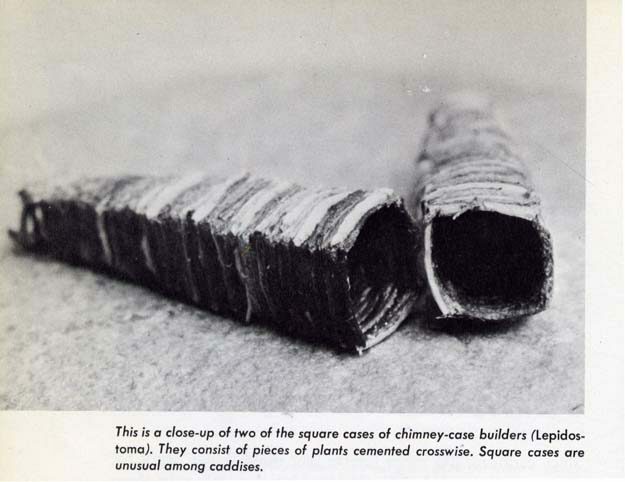 Other stick-builders are those called chimney-case builders (Brachycentrus) that construct cases which taper toward the rear and are square in cross-section. Their cases are formed of pieces of plant fiber cut to exact length and cemented crosswise. These caddises are excellent craftsmen and the case they build are smoothly tapered with neat corners. A human carpenter could not do better. Chimney-case builders are found in many places but are especially common in streams and springs. I have found large numbers on submerged logs in streams in the Rocky Mountain. 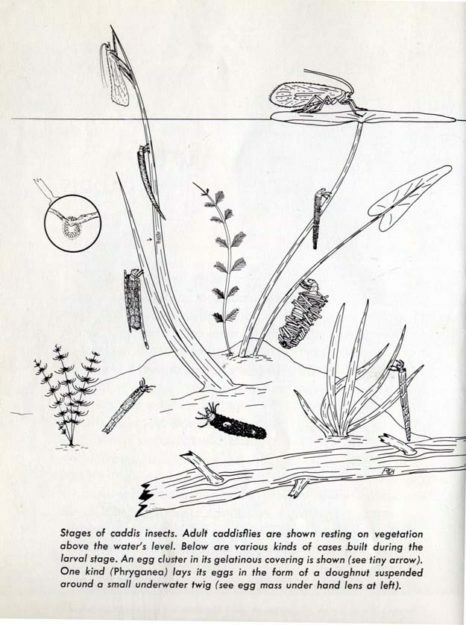 There is one caddis (Lepidostoma) with an unusual habit. It may construct it cases of either plant fiber in a square shape or of pebbles in round form. Some individuals may even build part of their cases one way and end up the other way. These creatures instincts or habits are apparently not definitely fixed. Among the more characteristic cases built by the stick-builders are those constructed by Pycnopsyche and other caddises. 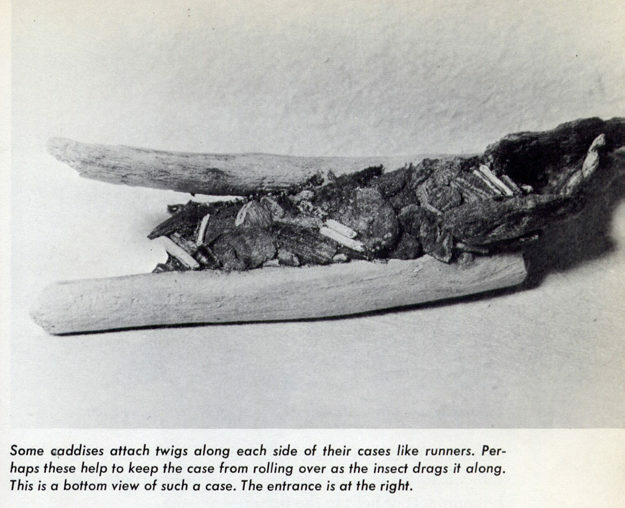 These cases are built of pebbles, sand, or wood fragments but have a small twig cemented lengthwise along each side like the runners of a sled. One wonders if these « runners » do not serve some purpose. Perhaps they aid the insects in pulling their cases along over mud or the gravel bottoms of streams. Somewhat similar cases are built by Neophylax and Goera caddises, though these are constructed of fine pebbles with larger stones attached along either side. Another caddis, Molanna, builds a curious stone case having flanges extending out from the sides and over the top of the front opening, like a roof. Possibly this shape helps to kep the cases right side up as they are dragged along by the insects. 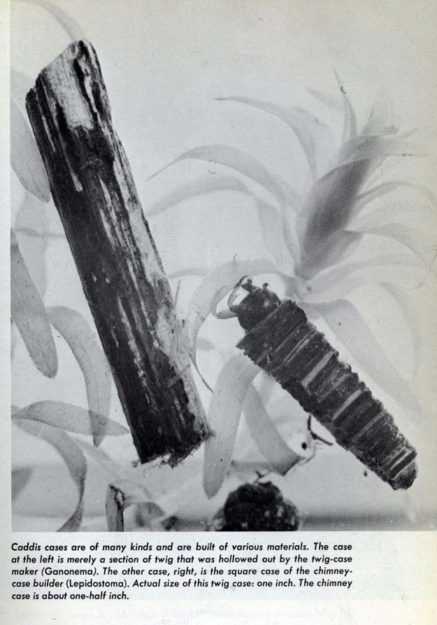 In a few caddis insects, such as Leptocella, cases are constructed of wood fragments or sometimes of sand grains with a long, slender stick or twig attached along one sid only. It is a little difficult to see how this serves any useful purpose but it must be some sort of help to the insect. 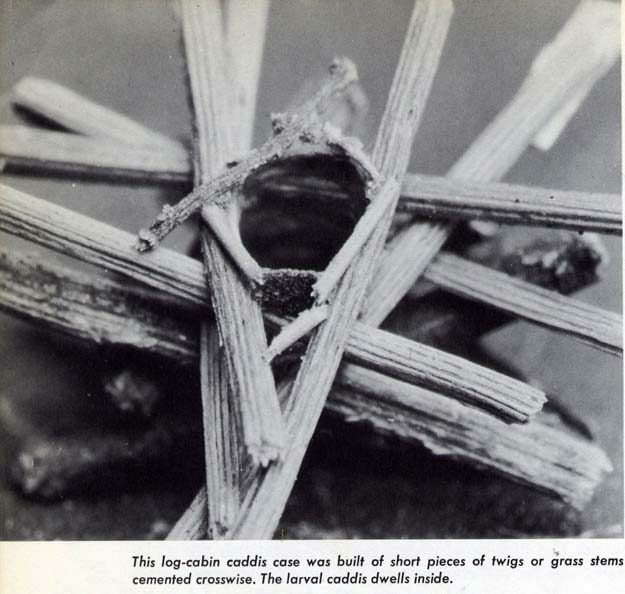 A unique case-making habit is found in a rather common caddis that, instead of cementing plant or mineral materials together, simply selects a solid twig of the proper diameter and hollows it out. Such cases are not only easy to build but the insect living Inside is well camouflaged from ennemies. After hollowing out the twig, the interior is lined with silk, thus making a snug home for the caddis larva. The first time I saw one of these, I thought my eyes were deceiving me. Here was a short length of twig crawling slowly across the bottom of a clear mountain stream! Cases of this sort are made by the twig-case makers (Ganonema). All the caddises we have so far discussed build cases of vegetable matter or stones so it may surprise you to learn that some kinds fabricate cases of silk or plastic-like material. This substance is secreted by glands in the insect’s head. One of these is the small flask-case maker (Leucotrichia) that spins a tough, cocoon-like case that is quite transparent. It has small opening fore and aft. It belongs to the familly Hydroptilidae which are know as micro-caddises because of their small size. While the cases built by the flask-case makers are transparent, they are usually covered with adhering sand or algae and so provide a good camouflage. 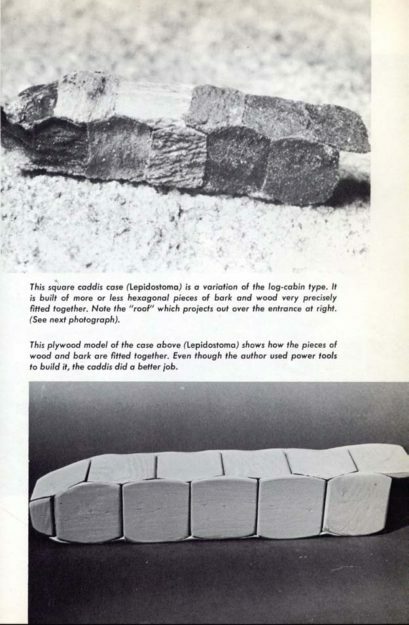 While the building of log cabins by human beings is an early American invention, certain caddises have ben building such structures for millions of years in many parts of the world. 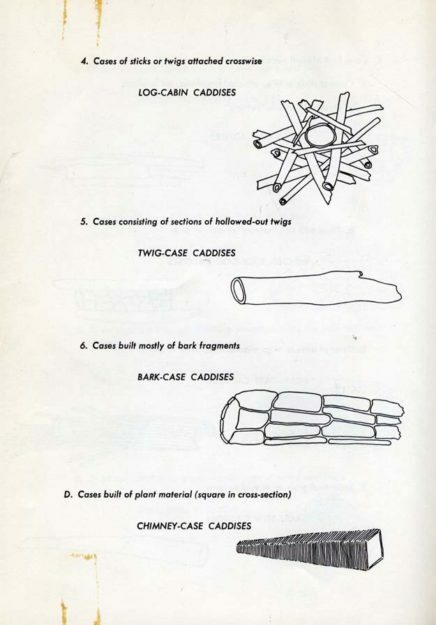 The stick-case buildrs discussed previously use sticks and twigs for cell construction, but these building materials are usually attached lengthwise. 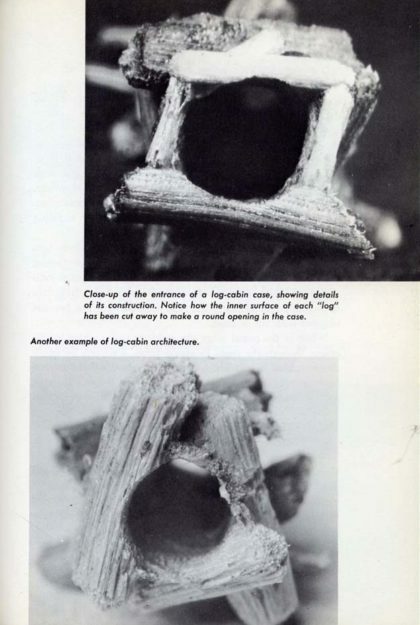 The log-cabin builder attach twigs crosswise of their cells, with the result that they resemble tiny log cabins. However the « room » Inside is round, not square as in a settler’s cabin. 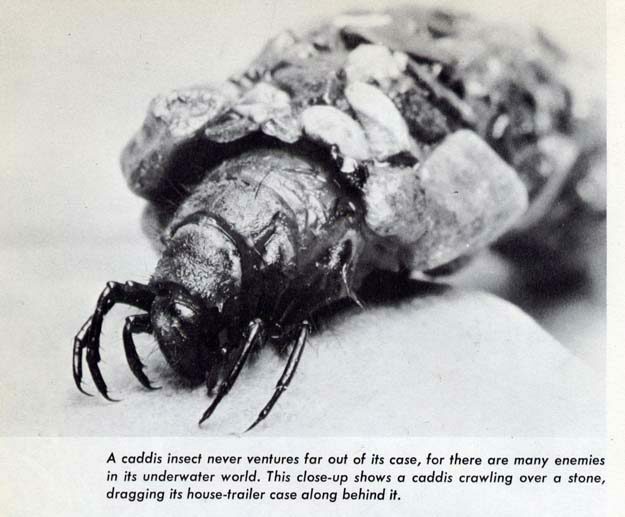 There are several caddises that construct their cases in log-cabin form but one most often seen is the log-cabin builder (Oecetis cinerascens) whose cases are found in streams and quiet pools in many places. It takes but little imagination to decide that the name fits the cases very well. While this log-cabin caddis build only one kind of case, always with the « logs » croswise, there is another kind that changes its building method as it grows older. This is the conbinatio-case builder (Limnephilus combinatus) of Canada. 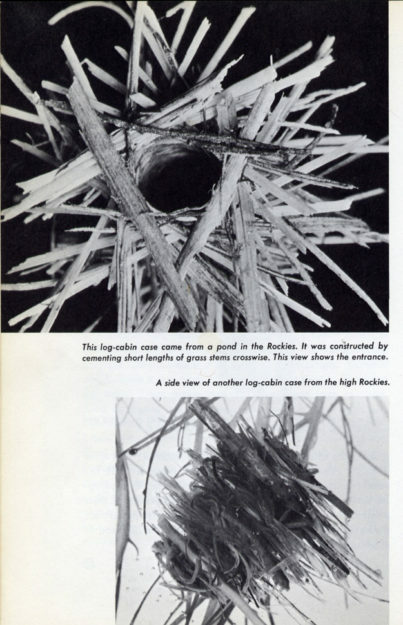 At first, this caddis build a typical log-cabin case; later it build a new, larger case ornamented with pieces of bark and, perhaps, small snail shells. 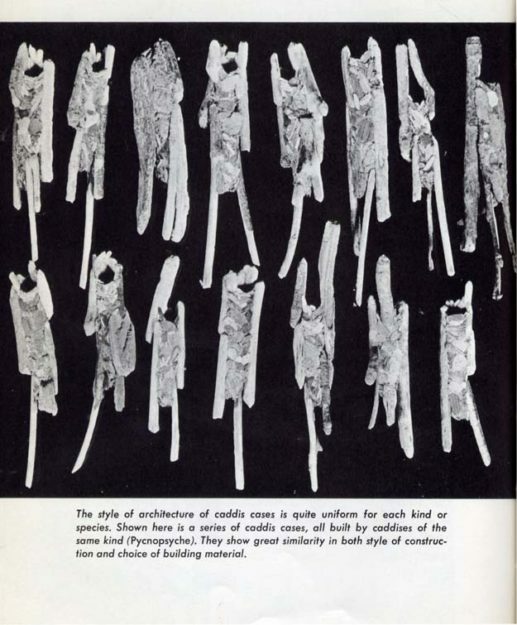 In the construction of its cases the log-cabin builder selects tiny twigs, pine needles, and other apprpriate objects and cuts them to the proper lengths with its jaws. These are cemented crosswise to the case, new material being added at the front end as usual. 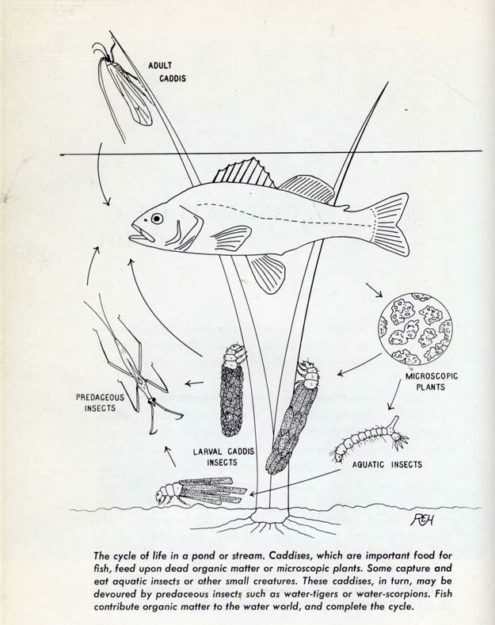 The caddis may then gnaw away or notch the center of the twig so that the opening or chamber remains circular in shape. It is quite amusing to watch one of these little craftsmen in the act of adding sticks to its case. Sometimes they use sticks as large as one-fifth inch in diameter and, since not all the sticks they use are waterlogged, some may be buoyant and tend to float to the surface. 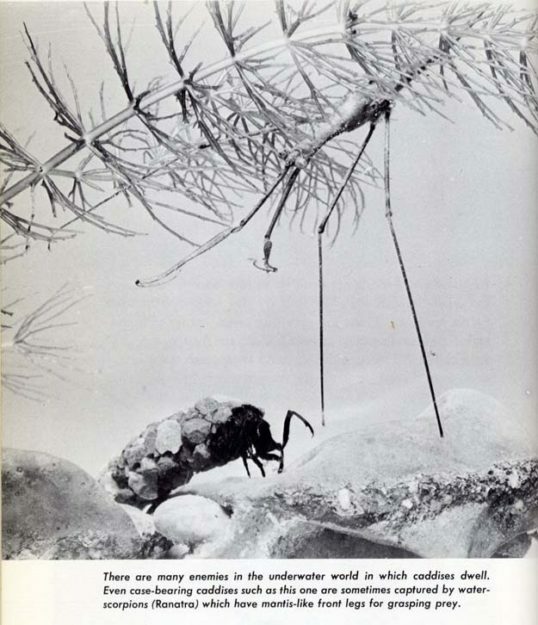 In such cases the insect must struggle violently, beating the water with its legs in order to hang on to its timber. Most log-cabin builders, unlike some other caddise, cannot seem to use other building materials and, if deprived of twigs, will not construct case. However, if they are carefully removed from their log-cabin cases they will obligingly construct new ones if the proper building material is supplied to them.